Fortune is fickle: and this is a message I learned loud and clear this past month. It’s been a busy one: packed with work, events, and a lot of Game of Thrones binging. It’s also been one where I splurged on some new fashion accessories and jewelry, which will take up most of this post. I also became a plant mother this past month, and I haven’t named her yet, but I’ll be taking suggestions ;) Let’s get into what I’ve been swooning over this March. Roman Numeral Ring from Etsy — Excuse the dusty image, as I’m playing around with different lense focuses (lol) but I thought overall this was a beautifully haunting shot of this ring I got this past month on Etsy. It’s your standard, customized ring, with my grandfather’s birthday: 1 - 8 - 2 - 9, written on the inside and outside. (That’s January 8th, 1929 btw). I have been wanting to get a piece of jewelry in his honor for a while, and I’m happy I finally settled on this one. 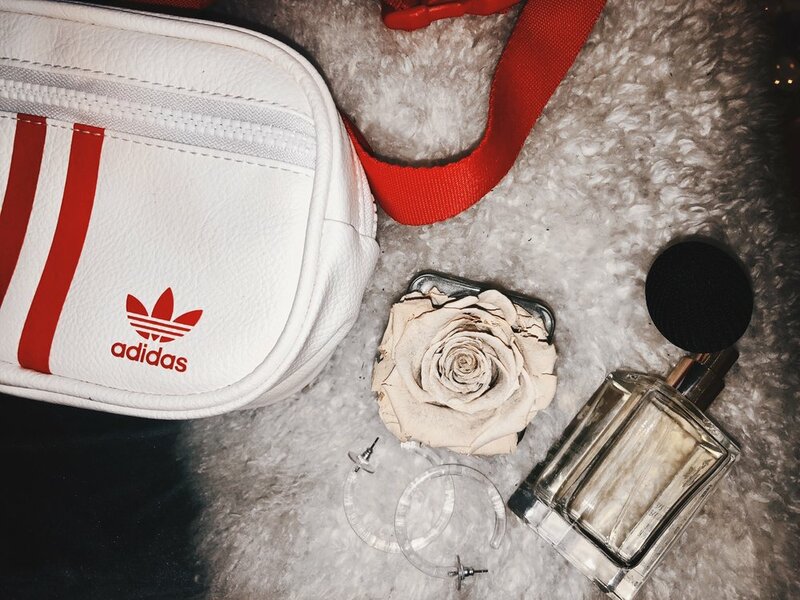 Adidas Fanny Pack — I was in search for a cute fanny pack this spring into summer season, and I fell in love as soon as I saw this one at UO. It’s white pleather, with bright red straps and the cutest zipper details. I can’t wait to rock this when I’m heading out of town on the weekends or even just to the beach around the city. Etsy Acrylic Hoops — Another Etsy purchase this month were these adorable clear acrylic hoops. I’ve seen them around a ton lately (I also own a pair of tortoise style ones), but they’re kind of expensive at most retailers, so I opted for an Etsy version which was more affordable and just as chic. Fila Disruptor III — I gave in guys. I got the chunky white sneakers that I always felt were strange, but are actually probably the coolest thing in my wardrobe now. I linked the pair from UO, but I actually ended up purchasing these from DSW where they were a little cheaper and the patent leather version, making them much easier to clean. How long can I keep them super white? Stay tuned. Snake Plant — Ahhhhhh! My favorite March purchase (pretty much ever)! I finally got my hands on this plant and I couldn’t be more thrilled. It fits perfectly into my room, is super low maintenance (TG!!) and just adds some happiness to the space. This joins the little cactus collection I have (2 large windowsill cacti, 3 mini ones in a terrarium on my vanity) and I’m just obsessed.